I love garden tours! You too? Come on in... 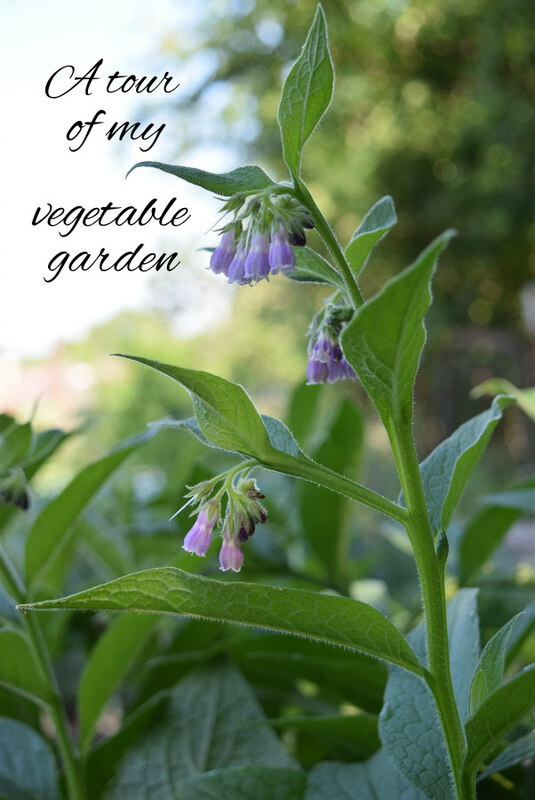 I love visiting other peoples' gardens and exchanging ideas, so this week I'm giving you a photographic tour of my vegetable (plus some herbs and flowers) garden. I hope you enjoy looking around. This post has a lot of images, because what's a photo tour without pictures? Thank you for your patience as they load. My blogging friend Danielle and I are both having tours of our gardens this week. I've included a link to her tour at the end of this post so you can go visit her garden too. I've been doing a lot of work in the garden this spring. A couple of years ago I decided to expand the size of my vegetable garden. It's taken much longer than I planned, and I'm still working on it, but I've made a lot of progress this year. My motto for this project has been "use what you have." Well, that's my motto for pretty much everything. I had to fence the new portion of the garden to keep our dogs out before I started planting in it this year. We had a run of fencing still up around part of the former goat pen. It was in pretty good condition, so I took that down, dragged it across the barnyard and used it to fence the new area. I still need to move one more small section of garden fence to tie the two sections together and add a new gate. Hubby and I have added two more raised beds this spring and have enough lumber cut to add a third. We had an old-and-dangerous shed torn down this spring and found a treasure trove inside: it was built with great lumber that's been protected from the weather for decades. We were able to "use what we had" to build the new raised beds as well as finish a few smaller projects around the homestead with that lumber. I need to get serious about thyme management. Let's start at this end of the garden. This is my perennial herb bed, although there are some non-perennials and non-herbs in it too; my plan is that eventually it will hold all of my herbs (except the catnip, lemon balm and other mints. You'll read why in a bit). The comfrey, rosemary and thyme are doing well. 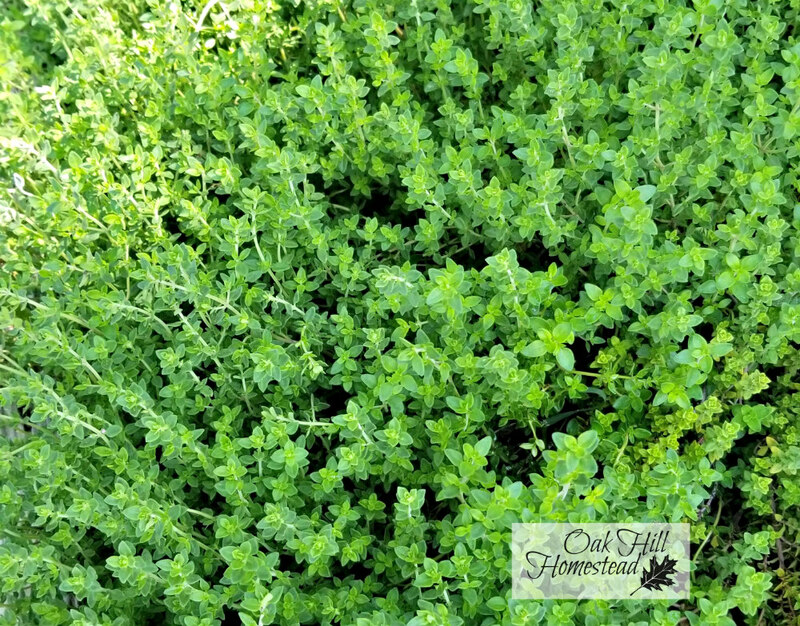 The thyme is really prolific and is threatening to take over that corner of the bed. I need to move my rosemary plant before the thyme swallows it whole. 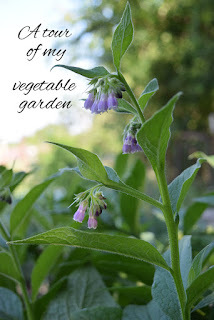 Related post: Why my garden is my "happy place"
The comfrey is in bloom now; a honeybee was lazily buzzing around the flowers while I was taking pictures; it was too bashful to pose for a photo though. In the empty spaces in the herb bed I stuck one of my many cherry tomato plants and a short row of garlic that was sprouting in the kitchen so I put them in the ground rather than let them go to waste. I planted zinnia and basil seeds that should be coming up any day now. The onion bed is amazing this year. 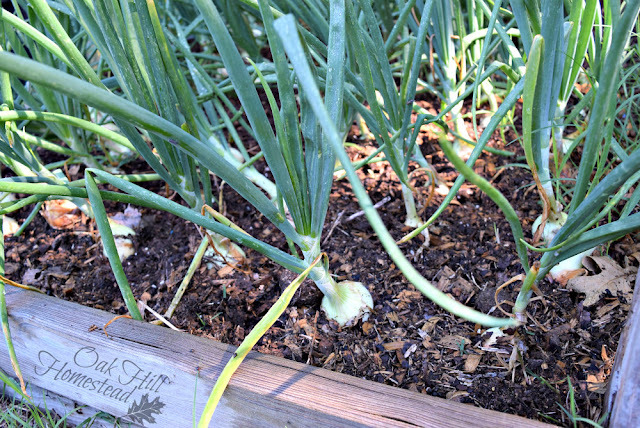 My experience with growing onions hasn't been exactly stellar in the past, but as long as we don't have a grasshopper summer I should have some really nice onions. A friend gave me these plants; I've always planted onion sets before. 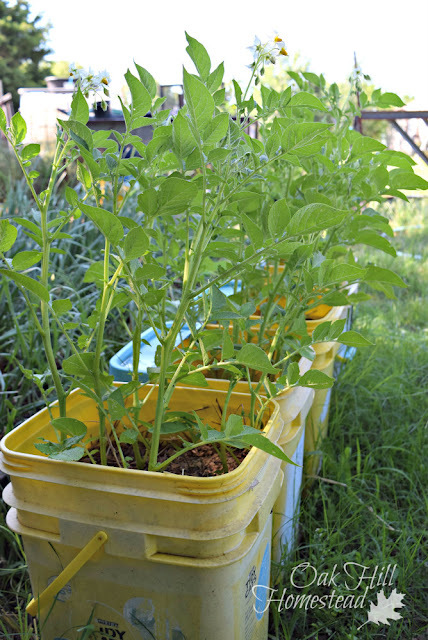 I'm growing potatoes in buckets as well as in a trash can this year. Last year's experiment was successful and I wanted more this year, so I put some kitty litter buckets to work. 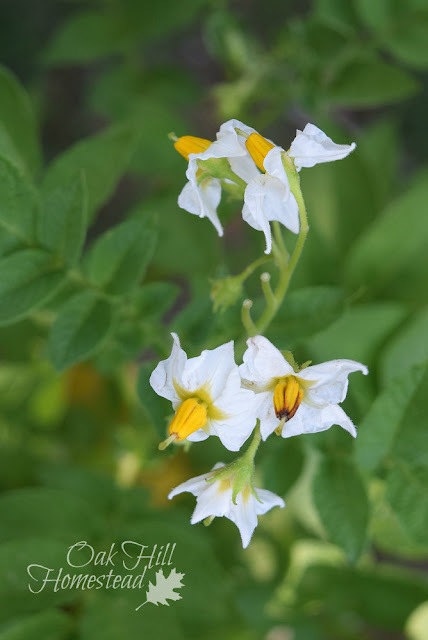 My potatoes never flowered last year, so I was happy when they all started blooming this week. The next bed has cabbage growing under a net that's doing a good job of protecting my plants from cabbage worms, although they're about to outgrow their tunnel. This bed also holds another row of garlic, eggplant and some nasturtiums, borage and lettuce. I don't know how much longer that lettuce will hold out; it's already summer weather around here and we'll hit 100° in just a few days. I have a funny story about the tomato plants: I bought transplants at the usual time, hardened them off, then went out of town for a week. The weather promptly took a nosedive and we had not just a late frost but a two-nights-and-an-entire-day freeze. Hubby covered the poor plants but they just couldn't withstand the 29° temperatures. So when I got back home I bought more transplants - a different variety that I don't like as well but it was all I could find because everyone else's plants had frozen too so tomato plants were in very short supply. And I couldn't find any cherry tomato plants. I love cherry tomatoes, almost more than I love regular-sized tomatoes. I finally found one red cherry tomato plant and bought it. I started a dozen more from seeds even though it was late; the seeds were kind of old and I expected a poor germination rate, but they were growing pretty well until I set them outside to begin hardening off and my dogs went on a tomato-plant-eating spree. 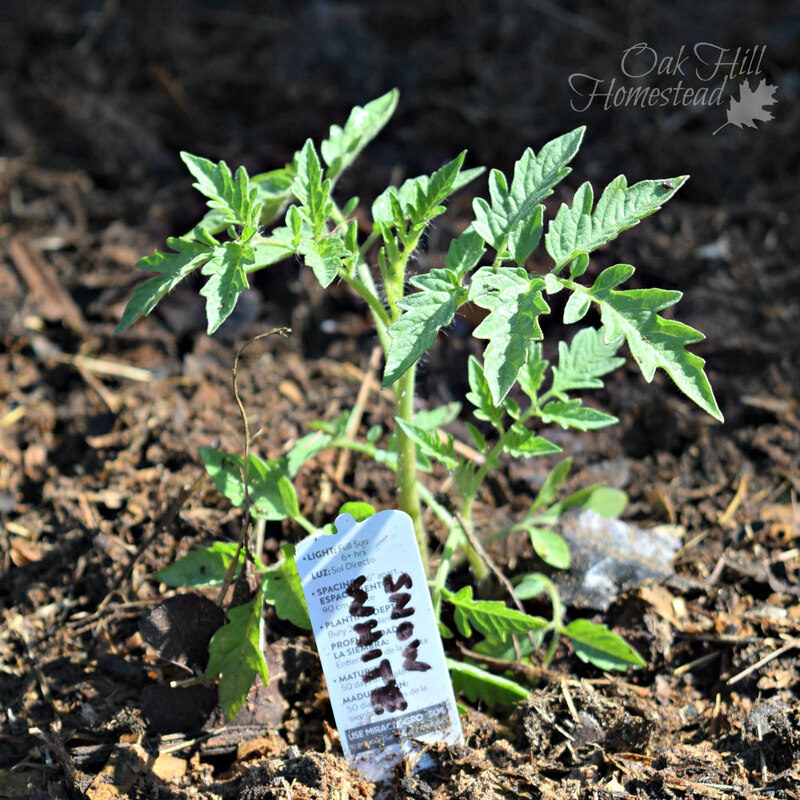 I saved just one "snow white" cherry tomato seedling. We went out of town again... and it was garden-planting time in the Midwest where we were visiting. They had lots of tomato plants for sale! So I did what any tomato-loving gal would do: I bought more tomato plants of several different varieties from a flea market vendor and squished them carefully into the car for the drive home. I know, it's a sickness. I'll never be able to eat all those tomatoes but I'll have a good time trying. Many of them are new-to-me varieties so I might even discover some new favorites. The tomato beds hold more basil and borage plants. 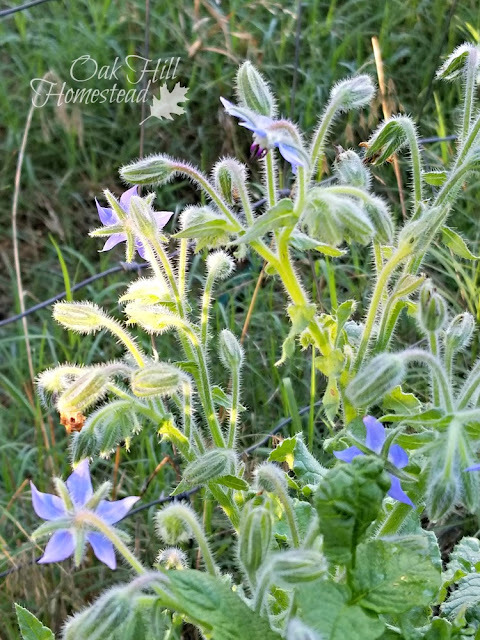 Borage is supposed to repel tomato horn worms. It seemed to do so last year, so I hope it's true and will work again this year. The newest bed, for now, holds one of my current working compost piles. My motto might be "use what you have" but if you don't have enough soil to fill another raised bed, you have to make some more... and that's what's going on here. 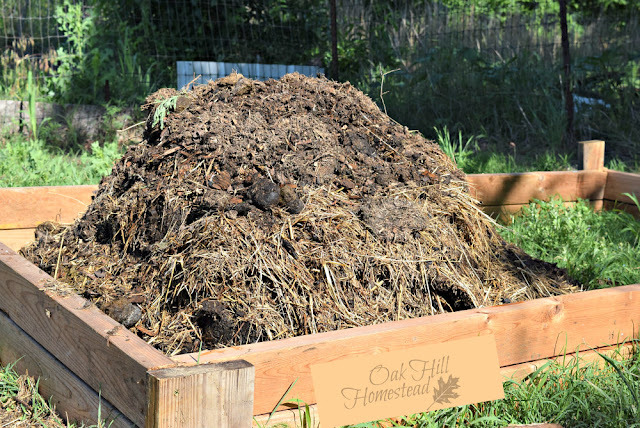 I make as much compost as I can all summer long, and this pile is HOT! Grass clippings, manure, spoiled hay, kitchen scraps... there's no shortage of the raw materials here at Oak Hill, but there is some effort in moving it all to the same place, getting the process started, and keeping the piles turned regularly. Making compost is one of the best ways to "use what you have," right? I still need to plant the sweet potatoes that are rooting in half a dozen jars in my kitchen windowsill. They'll go in the metal sink where I planted them last year; it's a great way to keep them safe from the armadillos that insist on digging them up and eating them. Since I can't rotate where I plant them, I'll change the soil in the sink every year. Under the sink is another cat litter bucket. I'm brewing comfrey tea in this one - the most wonderful, effective, free fertilizer for my garden. You can find the directions for making your own batch of comfrey tea here, and the reasons you'll want to. There's more growing in various pockets and big pots: brussels sprouts, broccoli, squash, eggplant... more garlic, more onions, more tomatoes. Ahem. That crazy cold snap we had in April took a toll on our fruit trees. The plum trees were in bloom when it hit, and I can't find a single baby plum on our trees. Not even one. 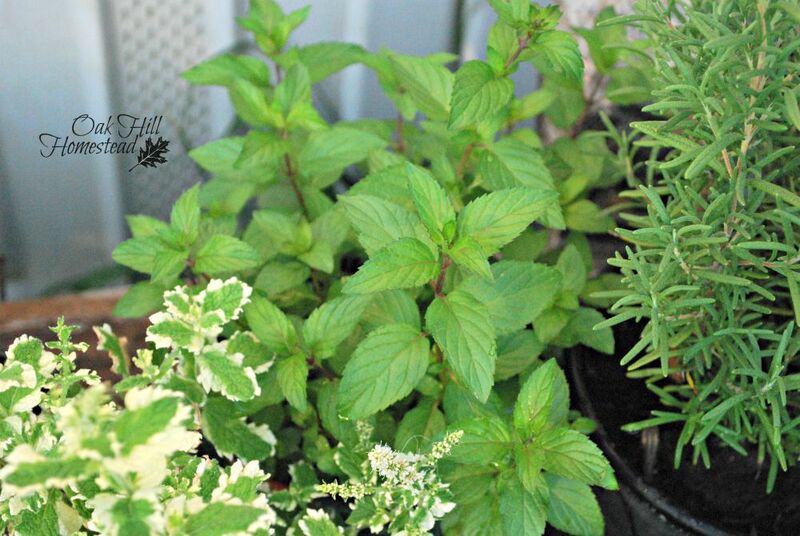 both members of the mint family, and mint is famous for spreading via its roots. It's easier to keep mint corralled by growing it in pots, but these seeded in secret and are growing out of control in the lawn and under the wooden steps where the herb containers are; some of the catnip plants are over three feet tall. The lemon balm sure smells good when we mow the lawn though. And my orange cat adores catnip, so he is pleased. Since I'm moving the herbs to the main garden now, I'm planning to use this space for flowers. You know, amid the out-of-control catnip and lemon balm. And then there are the roses... ah, the roses. I've added a yellow rose this spring, and I dug up and potted the red knock-out rosebush because it wasn't getting enough sun. They will both be planted by the new garden gate. I've been gardening here at Oak Hill for over a decade now, and I still have more failures than successes - but I keep trying. I think all gardeners have this in common: persistence and hope. Hope for a better outcome next time, and enough persistence to not give up. No matter what failures you're facing in your life, I pray that you will hold on to persistence and hope. Don't give up, don't let go of hope, keep trying. 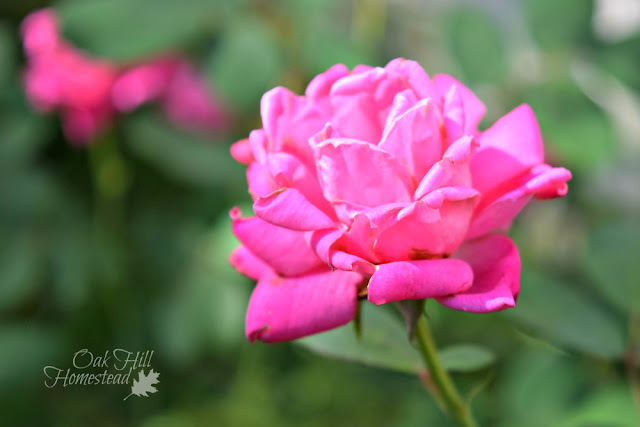 Would you like to tour my friend Danielle's garden too? She homesteads and blogs at Spring Lake Homestead in a completely different planting zone (zone 5) from my zone 7b. We both decided to offer a tour this week so y'all can visit back and forth, and she included a lot of news about her family's homestead projects as well as her garden. Leave a comment so she'll know you stopped by and where you came from. What's a "grasshopper year"? Your potatoes look AMAZING. Well all of your garden does. Love!! Everything is so big and green at your place! I'm hoping our gardens look something like that next month! Thank you, Danielle. We've been blessed to have a good amount of rain this spring - I sure hope it continues. No doubt your garden will look gorgeous too; you get a lot more rain than we do - and a little more dependably. You have a lot going on! A late freeze got most of my fruit trees, too. I have some cherries growing, as well as some apples, but no peaches or pears. My strawberries don’t seem to be doing as well as most years, and I don’t know why. I still haven’t tried raising borage, but I’d like to. Somehow, I think it’s kind of fun to search for horn worms, though, and toss them over the fence to my chickens. I’ll be envious of all of those potatoes when you start harvesting them! I haven’t planted any in several years. I'm envious of how much fruit you have growing on your place, Michelle - even if it didn't set much fruit this year. Margy, how nice to have the weather that allows a winter garden. Tell me, what's a "floating garden"? what a fabulous tour! I'm not sure which photo, plant, herb is my favorite. I did not know about borage and tomatoes. When I get opportunity to grow tomatoes again I'll have to remember. I think I'll add zinnias to my patio post this summer. I always planted a row along side my vegetables and they just make me happy. I hope you have a wonderful summer and a bountiful harvest throughout the growing season! Thank you, Linda. Hope you can have tomatoes again soon! Your garden is stunning, Kathi! I'm sorry you had trouble with your tomatoes, but everything looks amazing. I really enjoyed reading this post, I'm still giggling about thyme management! 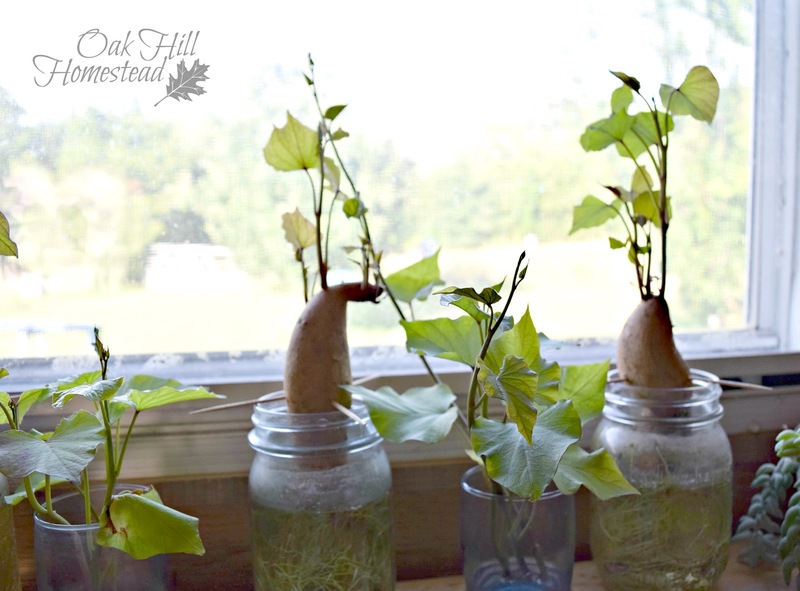 There are so many good ideas and links here, I'm featuring this post at the Hearth and Soul Link Party tomorrow. I hope you are having a lovely weekend! LOL - DEFINITELY need some more thyme management around here! Thanks for the tour- there is nothing like fresh herbs that you can pick right from your own yard. I used to have a fabulous mint garden for almost 20 years and then somehow poison ivy decided to join in.. we covered it with tarp and said goodbye being afraid to use any of it..
Ack, I'm sorry to hear about the poison ivy, Judee. I loved touring your garden! So much fun to see and hear about other gardeners' dreams, successes, and yes, even the not-so-successful attempts. On your plum trees that the late freezes affected, are they sand plums or another kind? Now I'm heading over to your friend's garden!